Polyurethane, or PU as it is commonly known is a great material for making safety PU footwear. This is because of the way PU is produced, to create foamed polyurethanes – a type of PU made through a reaction between diisocyanates and polyesters. Whilst you don’t really need to know the technical terms, it actually means that it creates a whole lot of tiny micro bubbles between all of the PU molecules. This makes it more comfortable to wear, as the air bubbles act as a cushion. This is one of the many reasons why we use it to create our PU boots, but you should know that a pair of Frams safety PU boots has a lot more to them than just PU alone. A Dual Density Sole Whilst using a single sole is still a viable method of producing safety PU footwear, we choose to stick with dual density. This is because it creates a hardwearing outer sole and a lower density comfort midsole. These soles also wear at a much slower rate, ensuring that your safety footwear lasts longer. The underside of our safety PU boots also offer good slip resistance through a specially designed sole pattern. Heat Resistance Your required level of protection from heat will depend on the type of heat exposure in your working environment. The Frams Dual Density Sole range offers you heat resistance up to 95 degrees Celsius. Should you require even higher heat protection, our Vulcanised Rubber Sole range will be able to cater to your needs. The styles in this range have a heat resistance of up to 300 degrees Celsius. A Bellows Tongue A full Bellows tongue wasn’t added to some of the styles in the Frams ranges by accident. In fact, it’s just another way we try to provide our customers with added safety. This specially created tongue provides additional protection against flying sparks or splashing solvents. This is because it overlaps on the inside of the shoe to cover the top part of your foot. This means that should the tongue move during the course of the day, there will be no gaps for harmful substances to pass through. Great Uppers At Frams, we use genuine leather uppers. These not only offer a great look to our safety footwear, but they also ensure antistatic properties. They’re also good with wear and tear, making them the perfect choice for our ranges. Steel Toe Cap We know that industrial working environments are full of heavy objects that could fall and cause foot injuries. It’s why the styles in the Frams Dual Density range are available with a steel toe cap that withstands up to 200 joules of pressure, for your safety and peace of mind. Chemical Resistance Should exposure to chemicals be of concern to you and your safety at work, PU safety shoes offer good chemical resistance. To see if a pair of Frams double density safety PU shoes will meet your chemical resistance needs, please check out the chemical resistance table on our website by clicking here. Should you require protection against a range of harsher chemicals, acids or oils, we recommend that you consider a style from our Vulcanised Rubber Sole range. Safety Standards and Certifications If you’re going to be buying a pair of safety boots, you need to ensure that your chosen brand meets safety standards and manufacturing certifications. The Frams factory is ISO 9001 certified and our products are either EN 20345 or SANS/ISO 20435 compliant. Affordability is key At Frams, we understand that not everyone can afford premium safety PU footwear. We also know that no one wants to sacrifice protection to save a few rands, either. This is why we continue to provide economical safety for your peace of mind and the wellbeing of your short-term workers. 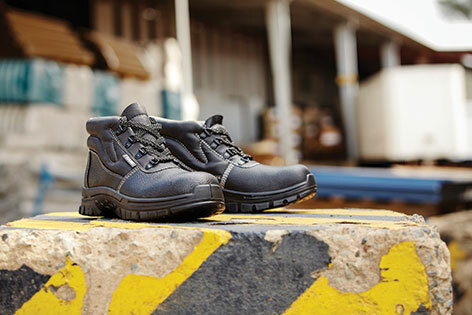 By ensuring that you select a reliable pair of PU boots, you’ll be able to enjoy safety on the job. Frams stands for affordable safety footwear that you can trust, which is why so many in the contract work force rely on us to deliver exactly that. For more on our ranges, visit our website, www.frams.co.za.